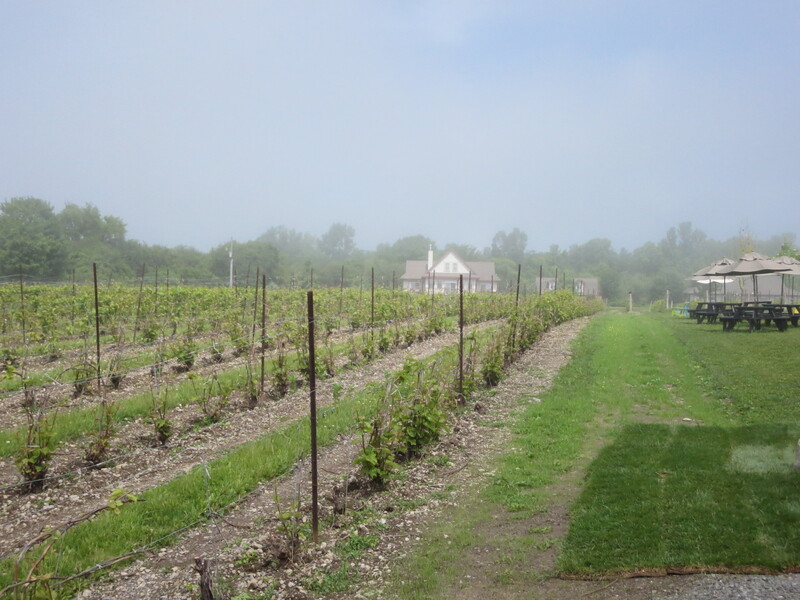 A couple weeks ago visiting wineries in Prince Edward County I got the chance to see – first hand – the impact of the cold snap that hit on May 22-23. Our first stop was Hillier Creek Estates. As we drove in my friend wondered whether the vines planted out front were new, as they were very small and virtually no leaves. I said I was pretty sure that that in years past those vines were tall and hearty with leaves. Woody Cassell, the vineyard manager at Hillier Creek Estates told me the sad news – all their vines were damaged in the cold snap in May. The primary and secondary buds were so damaged that they won’t be harvesting anything this year. Woody was kind enough to take me into the vineyard to show me. Here’s a short video of Woody explaining what they’re doing this year. Though walking through the vineyard was sobering – leave it to Mother Nature to provide a reminder that just because there won’t be grapes this year, doesn’t mean there aren’t other signs of life. 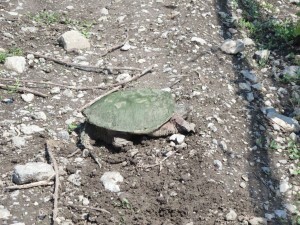 Sitting smack dab in the middle of the row was a huge snapping turtle. Woody explained they get them every year. 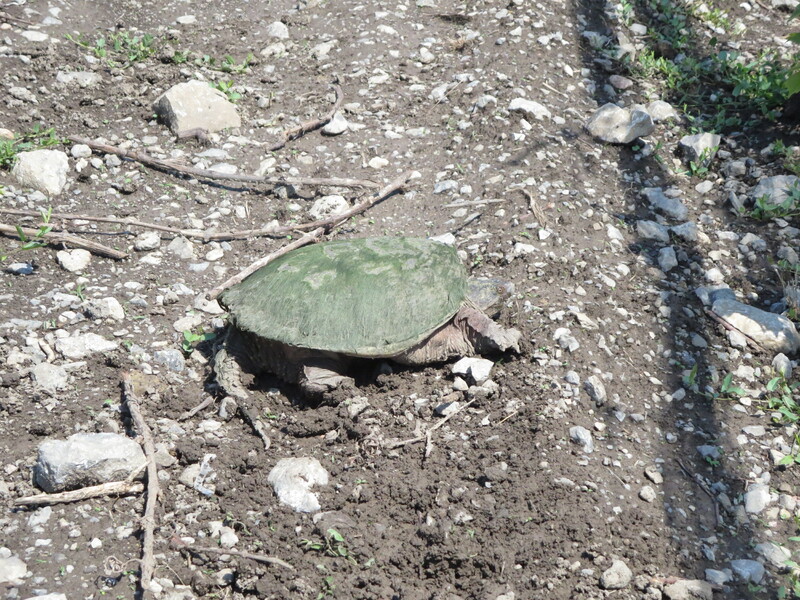 Apparently they wander over from a nearby creek and they bury their eggs in the vineyard. So, in a few months’ time little turtles will be scurrying about — as usual. 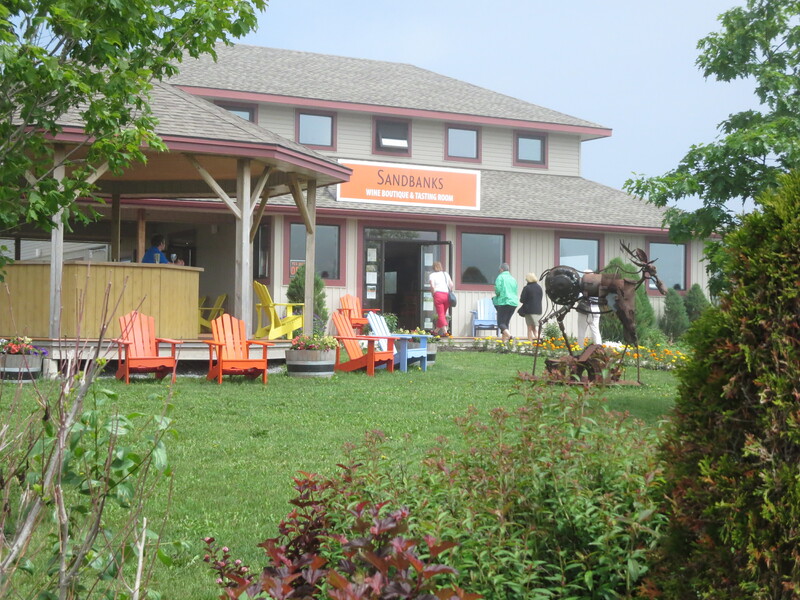 We then headed to Sandbanks Estate Winery, which is much closer to the water than Hillier Creek Estates. En route we passed through lots of fog. Indeed, the closer you got to the water, the better you could see the fog literally rolling in. 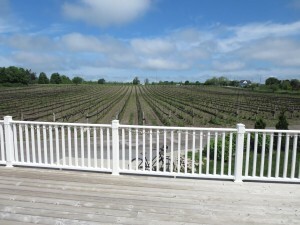 The moderating impact of the water was clear at Sandbanks Estates, as their vines looked healthy and green. 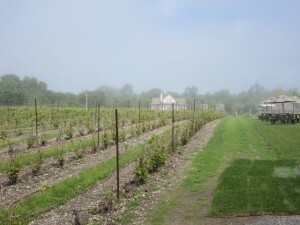 Unlike Hillier Creek Estates, the late May cold snap didn’t impact their vines at all. 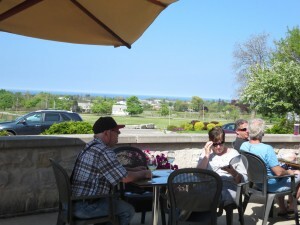 Nearby Keint-he Winery & Vineyards suffered some loss, but like Sandbanks, they were luckier than some. And of course, they – like other growers in the county – did all they could to try to keep the air circulating those cold nights, but with record low temperatures, there’s only so much they could do. When in Stuck in Traffic … Get Off the Highway and Enjoy! Sunday a friend and I headed to Niagara-on-the-Lake for Sip & Sizzle. 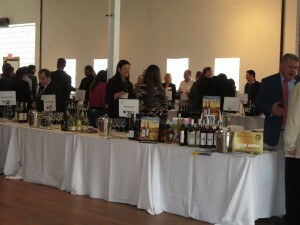 It was a beautiful day and I had the list of participating wineries and a bit of a plan about which we might stop at. My friend picked me up at 11:30 and we headed out. From here it normally takes just under an hour to get to the NOL region. A few exits after we hopped on the expressway, we saw a sign warning of slow traffic. My friend’s GPS traffic monitor concurred – but we continued on, thinking that it was just some minor slow-down. After all – it was a Sunday afternoon. Well, traffic didn’t let up. If anything, it increased – a lot – the further we went. 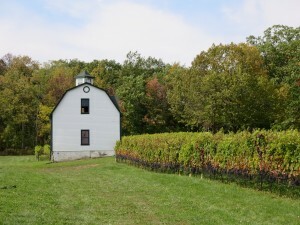 As we crawled along, I suggested that we alter our plan and instead of going to NOL, we hit some of the wineries that are closer to Toronto. My friend didn’t really realize that there are wineries en route to NOL, so he was fine with my suggestion. It’s a lovely spot, high up on the top of the Escarpment. They had a $3 Flight & Bite sample. 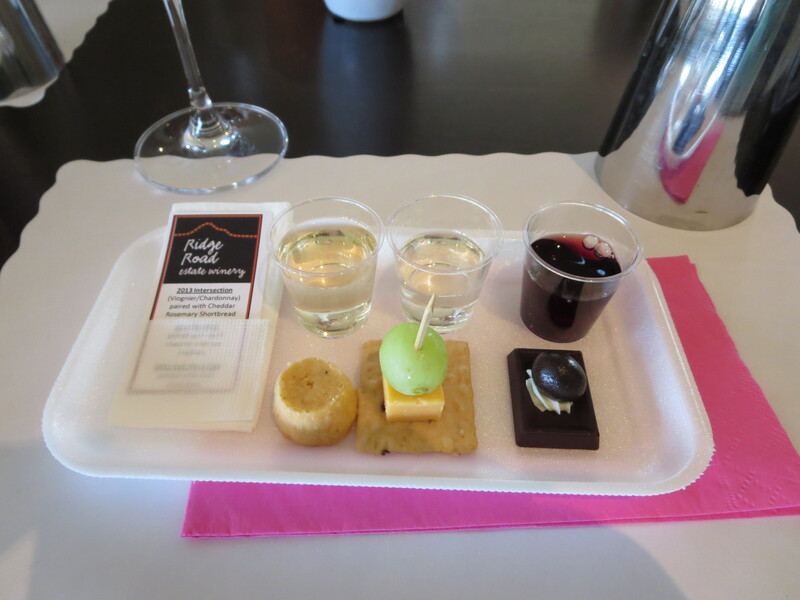 The flight included their 2013 Intersection, which is a Viognier-Chardonnay blend paired with a rosemary shortbread, their 2014 Riesling, paired with aged cheddar on a rice cracker, and their 2011 Call Me a Cab, which is red blend. It was the perfect way to de-stress after two hours (YES, 2 hours!!) in the car. 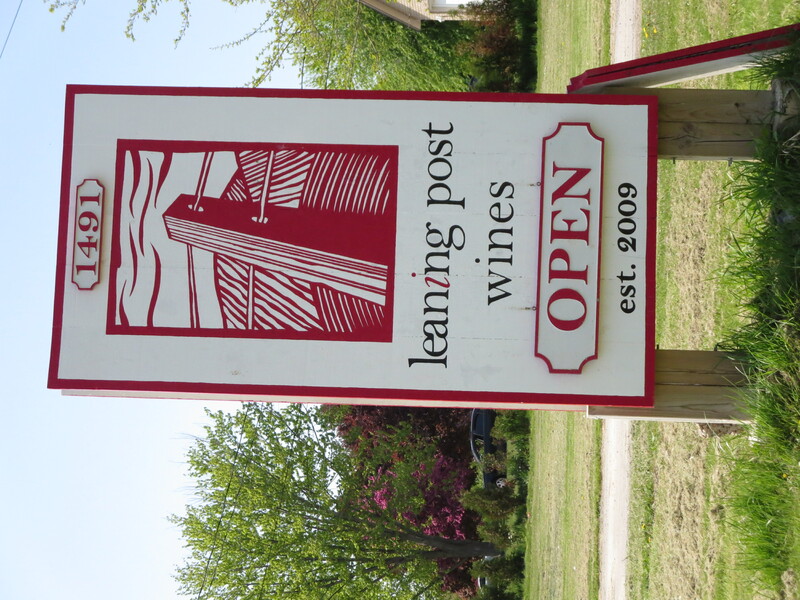 From there we headed back down the hill to Highway 8 (that’s the road that curves along the bottom of the escarpment – it’s lovely) to a Leaning Post Wines. 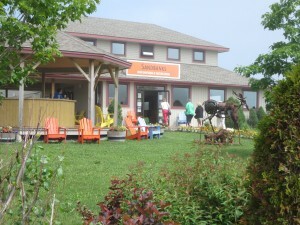 Ilya Senchuk and his wife Nadia just opened last summer. They were hosting a wedding celebration in a tent out back – but they tasting room was open and Ilya and Ryan were pouring and happy to tell us about their wines. The Senchuks have planted their own grapes, but they’ve been a virtual winery for a while with grapes from other vineyards. 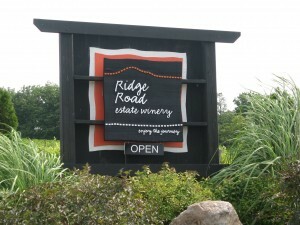 One of the things I loved about their wines is that they specify which vineyard they sourced the wines from. We tried two of their whites – both of which are from the Foxcroft vineyard: their 2013 Riesling and The Fifty, which Ryan described as an “unoaked, oaked Chardonnay”. 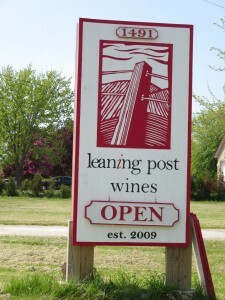 They also had three Pinot Noirs – a 2011 and 2012 from grapes from the Lowrey Vineyard (the vineyard tended by Wes Lowrey of Five Rows Craft Wine) and a 2012 from McNally Vineyard. The opportunity to taste the same variety from different years and different vineyards is a great treat! It is very interesting to taste the two Lowrey’s from different years (2012 being the more spectacular year in Niagara) and then compare it to the 2012 McNally. The McNally was our favourite and my friend brought home a bottle (I didn’t drop any hints about sharing it with me sometime… but I’ve got my fingers crossed). I left with a bottle of The Fifty, which I’m putting away for an afternoon with some other friends who I think will really enjoy it. From there we continued along Hwy 8 to Peninsula Ridge. We were hoping that their restaurant was still serving – but they had stopped serving brunch at 3 and we were there closer to 4. We did, however, try some wines and, though I was very disappointed with their 2008 Fume Blanc, we loved their 2012 Syrah and my friend took some of that home too. After that, since it was already late, we called it a day and headed home. Driving home I realized that despite the fact that the traffic was horrendous and we didn’t make it to our originally planned destination – we had a terrific day. In fact, the day really was the epitome of what exploring Ontario wine country is all about: getting off the main roads and following the signs and simply stopping in at a few wineries and trying the wines! A visit to the Welland Canal might not be high on your list of sights to see in-and-around Niagara Falls, but I guarantee it’s a side-trip you’ll remember every time you see a ship on Lake Ontario. A friend and I were returning to Toronto from a day of visiting wineries recently and we were on a back road when traffic ahead was stopped. 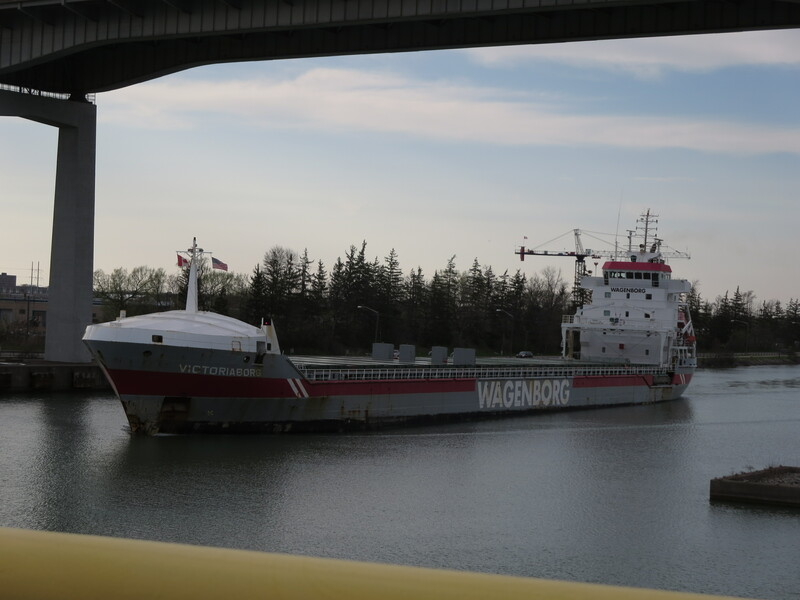 We soon realized it was because a bridge across the Welland Canal (which is part of the St. Lawrence Seaway) was being raised to allow a Great Lakes freighter through to the nearby lock. The Canal has eight locks, two of which are accessible to the public – one of them is Lock 3. My friend had never seen a ship go through a lock, so we pulled into the nearby Welland Canals Centre. Having been to the Canals Centre before, I knew it is a terrific place to watch the processes. 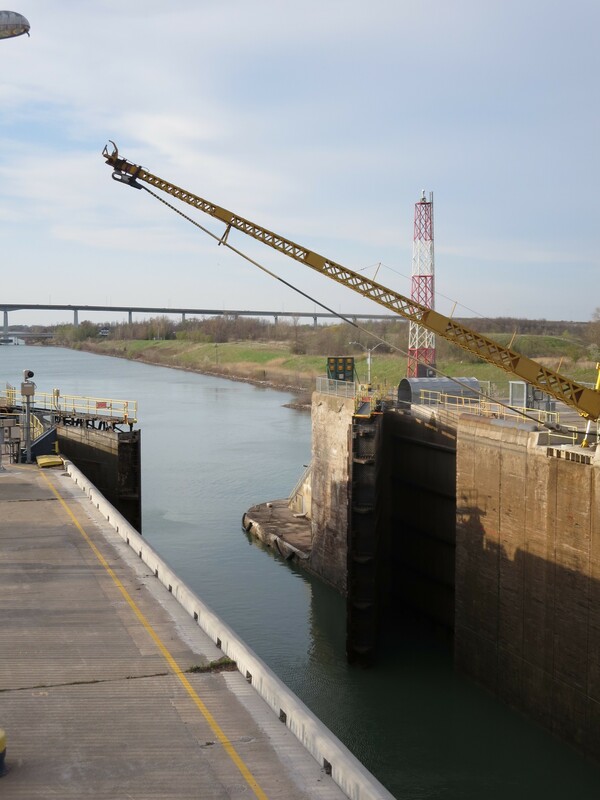 Though you can watch the goings on from the side of the lock, a raised observation deck running almost the length of it lets you watch from 20 feet above. 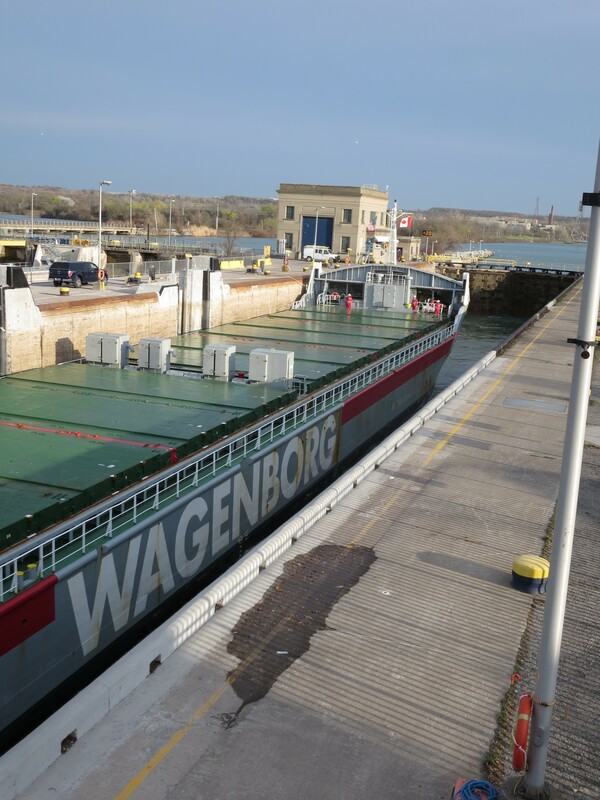 You get a bird’s eye view of the process, starting with the massive gate closing behind the ship and then watching the boat float up as the lock fills with water (or disappear down into the lock as the water drains from it). The whole process is amazingly quick, with ships in and out of the lock in about 20 minutes. From the observation deck you also get a great view of Port Weller, the entrance to the Canal from Lake Ontario. 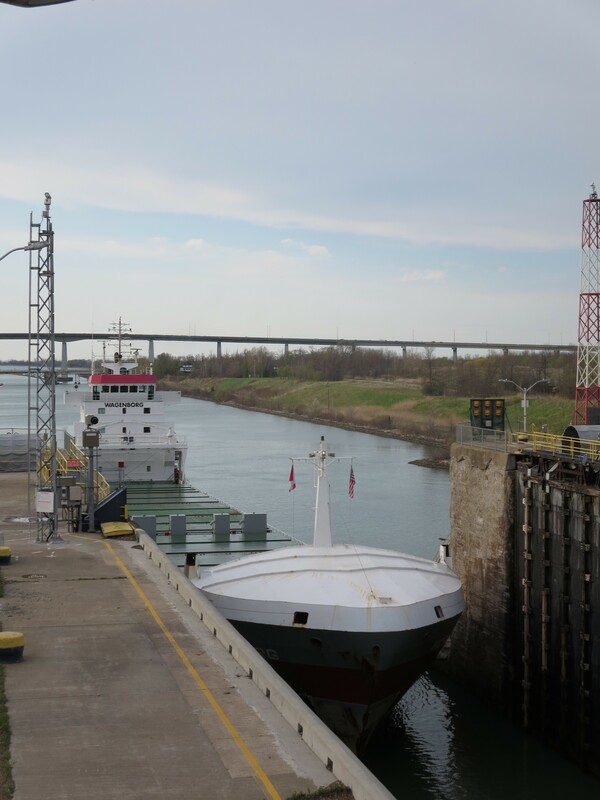 From that vantage point you’re likely to see ships making their way through Locks 1 and 2. 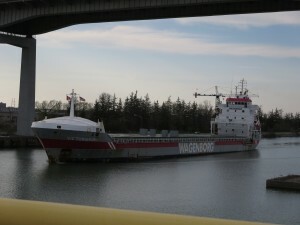 During the course of a morning or afternoon it’s not unusual to see two or more ships lifted or lowered through Lock 3. 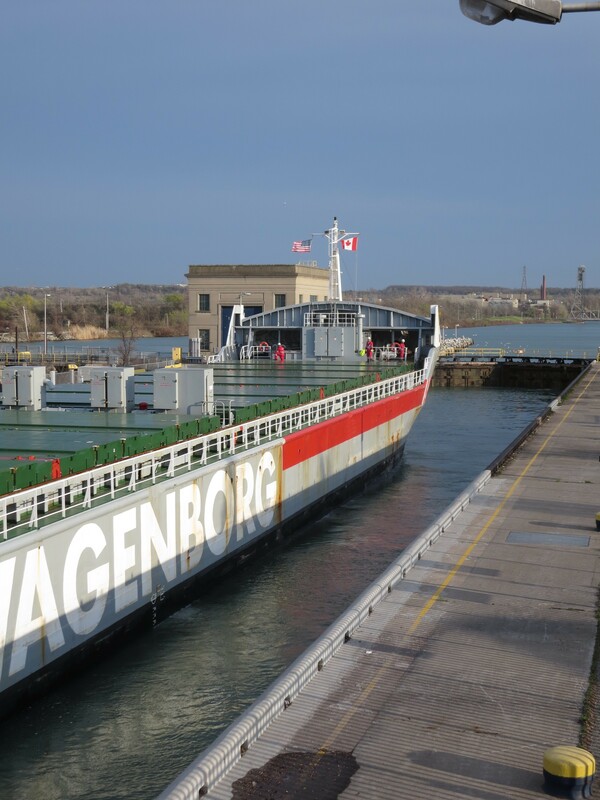 If you’ve ever seen a ship on Lake Ontario and wondered how it makes its way to Lake Erie, next time you’re headed to the wineries in St. Catharines or Niagara-on-the-Lake, you should stop at the Welland Canals Centre. As promised, a bit more about the new program that allows Ontario wineries to sell and offer tastings of their VQA wines at Farmers’ Markets. There are also rules about what markets qualify – basically they have to be centrally located (so no side-of-the-road sales from pick-up trucks!) 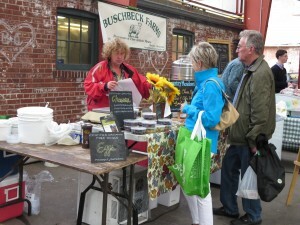 and have stalls at which people offer for sale farm products, baked goods and preserved foods that are their own products. 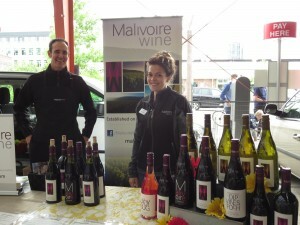 The AGCO has a list of Farmers’ Markets across the province at which wineries can sell. The list is updated weekly. Here’s a list of the markets as of June 16, 2014. One other curious requirement is that the wines must be transported from the winery on the day they are for sale at a market and any unsold wine must be returned to the winery at the end of the day. 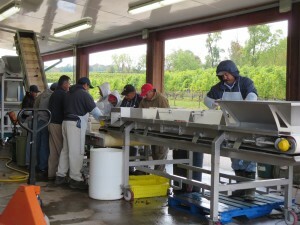 So, for the wineries that means a lot of schlepping on market day – and a lot of early mornings to make sure that the wines get to the market on time. 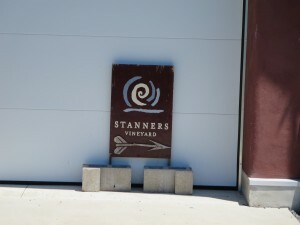 Stanners Vineyard is a small winery (they produce about 1000 cases/year) in Prince Edward County. They’re participating in the program at a number of markets here in the Toronto area. 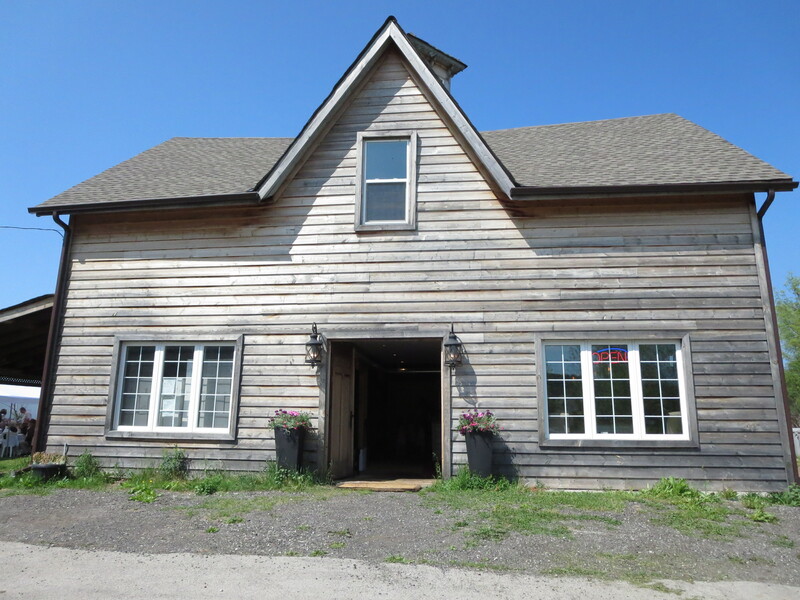 (Just imagine what time they have to leave the winery in PEC to set up shop at a booth here in Toronto by 9 a.m. on a Saturday!) 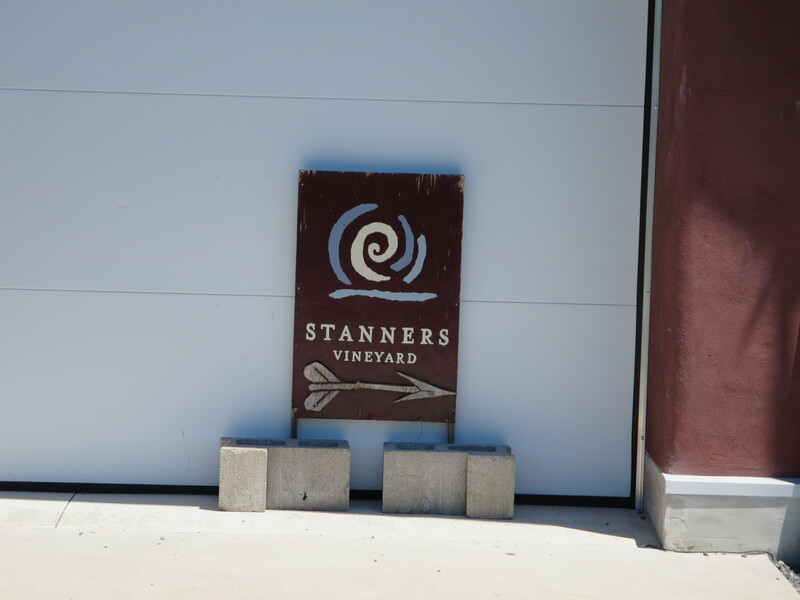 I asked Colin Stanner, owner and winemaker at Stanners Vineyard, about their participation in the program. 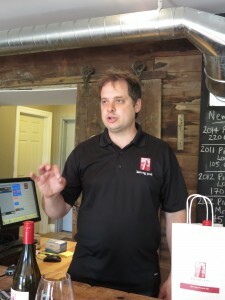 Colin said they decided to participate because their wines aren’t available at the LCBO and they saw the program as a way to give people a chance to try and buy their wines without having to make a trip to the winery or buy on-line without having tasted the wines. They also like the idea of being able get their wines “to people right in their own neighborhood”. And finally, when asked how it’s been going, Colin admitted it’s been a lot of driving and a fair bit of work to set up and take down each time, but sales have been good and he’s been pleased with it. 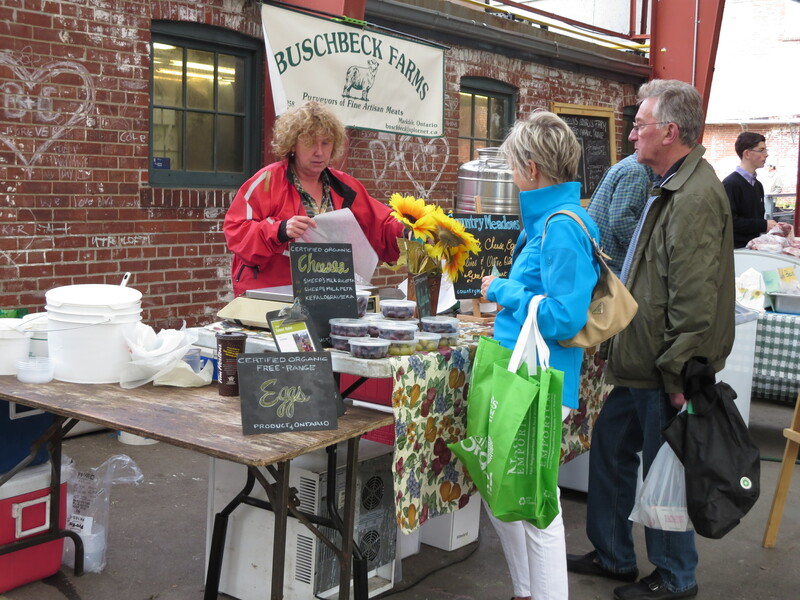 “The Farmers’ Market atmosphere is festive and people have been so happy to finally be able to taste and buy while at a market! 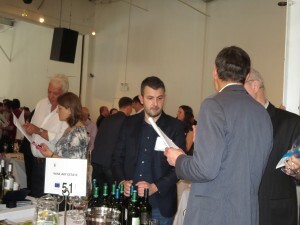 … It’s also very fun to meet people in the market environment and talk with them about our wine,” he said. 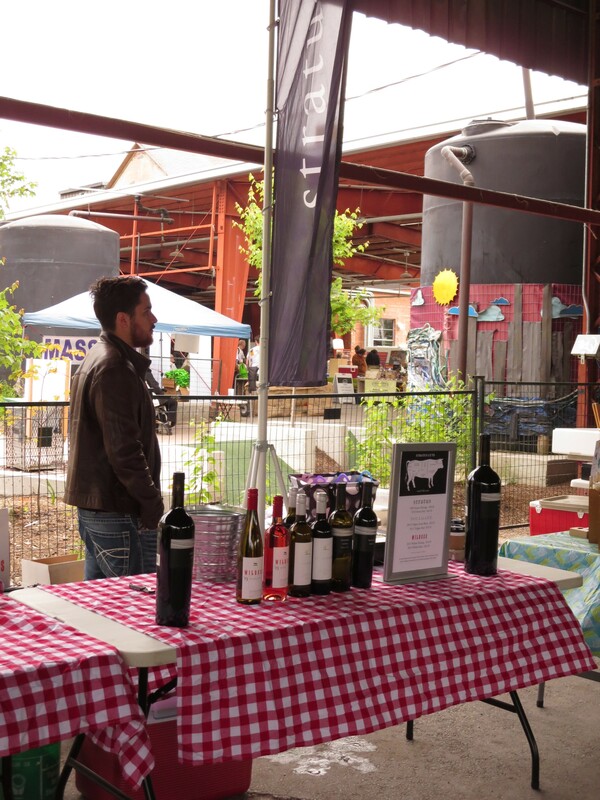 FYI — Stanners Vineyard will be at the Aurora Farmers’ Market on Saturday, June 21, 2014 and Leslieville Farmers’ Market on Sunday, June 22, 2014. 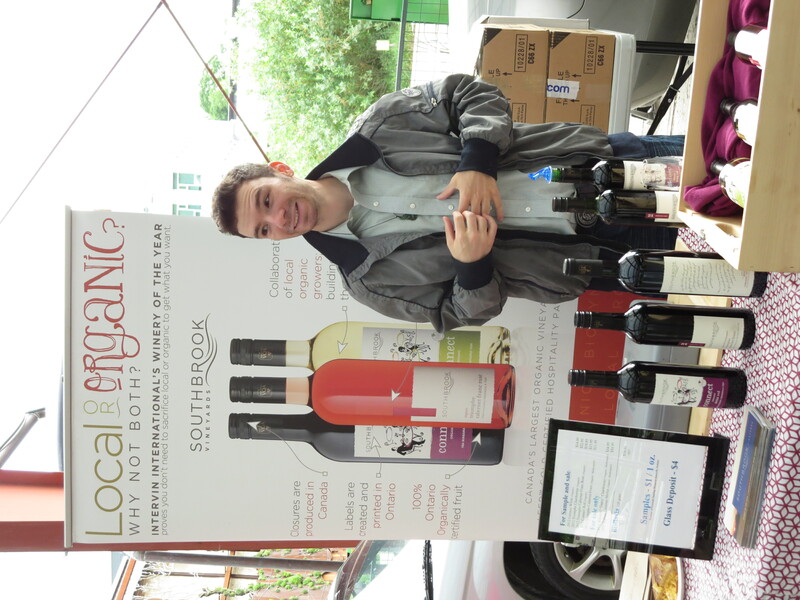 As for the rest of the summer, they’re also attending the Junction Farmers Market, Withrow Park Farmers’ Market, Wychwood Barns, the Sorauren Farmers’ market, and the Concord Park Place Market in North York. Check their Facebook page for specific dates and times. 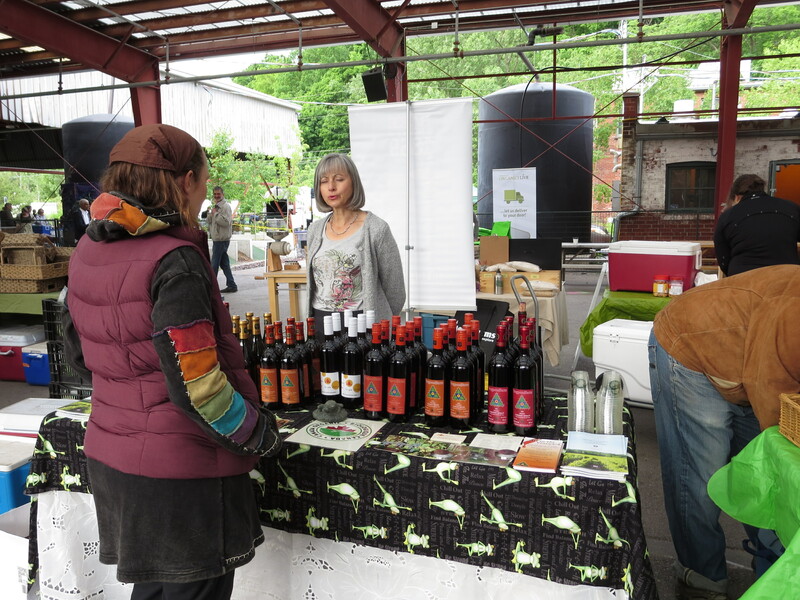 Ontario is piloting a program at Farmers’ Markets that allows Ontario wineries to set up booths at local markets to sell their VQA wines. 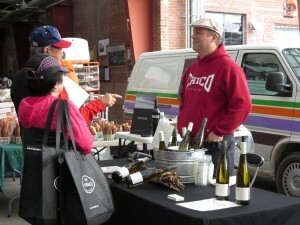 I checked out the Brickworks Market this morning to see what wineries were there and to see how it’s going. This program is terrific for folks who might be shopping for the freshest ingredients for this weekend’s meals (Father’s Day BBQ?). As you plan your menu, you can consult with the folks at the winery booths (tables, really) to come up with the perfect food and wine pairing. 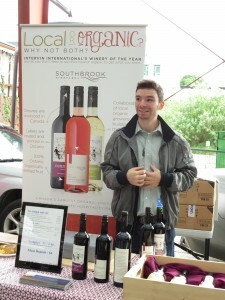 Different wineries are participating in the program at farmers markets across the province. So, a few weeks ago, on a glorious autumn weekend I set out to walk the “Upper Loop”, which isn’t a loop per se. 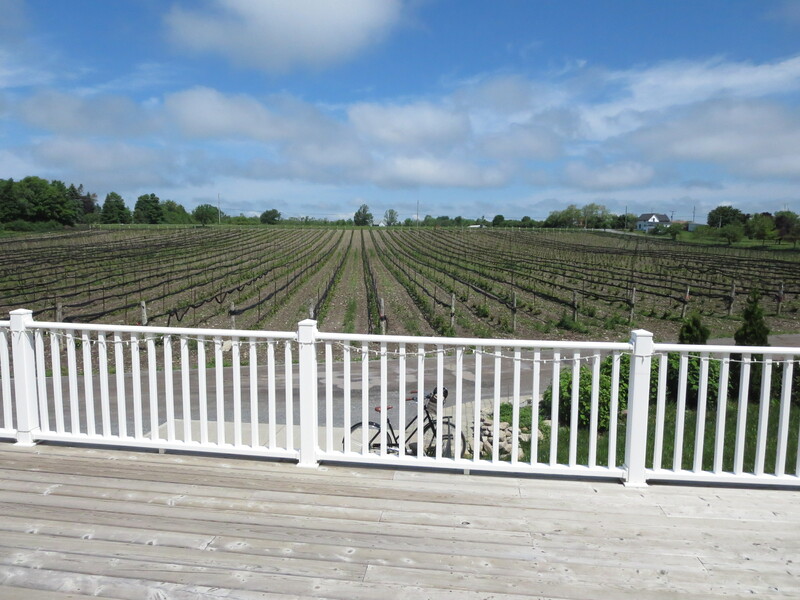 According to the trail map, the upper portion includes Hidden Bench Vineyards & Winery, The Organized Crime Winery, and Fielding Estates Winery. I decided to start at the top, so I parked at Fielding Estates. It so happened that weekend was one of the Niagara Wine Festival weekends, so the place was hopping, which is always nice to see. 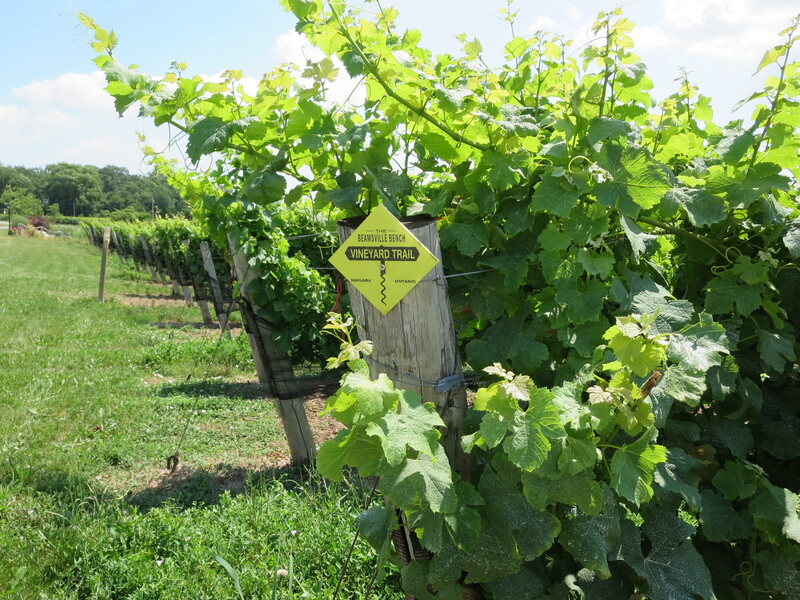 Fielding sits high atop the crest of a hill and from the top looking down toward the vines I easily spotted the unmistakeable yellow diamond Vineyard Trail marker and I headed toward it. Once I hit Locust Lane I couldn’t see any trail markers on The Organize Crime Winery’s property. So, rather than roaming through the rows of vines I decided to stick to the road. I figured if I didn’t see a trail sign, eventually I’d end up at Hidden Bench’s main driveway, which is what happened. Hidden Bench was a beehive of activity, with about a half dozen folks sorting just picked grapes. It was fun watching them and knowing that the grapes were full of the summer sunshine and that before long the summer’s work would pay off in the form of the next vintage. 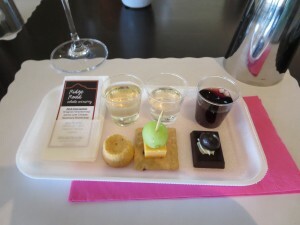 I popped into the tasting boutique to see what was going on and to find out where I went wrong on the Vineyard Trail. 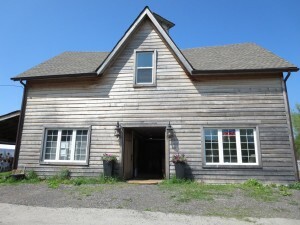 It turns out the reason I didn’t see any trail signs from Fielding Estates to The Organized Crime Winery was because they had been taken down. Apparently The Organized Crime Winery has decided to pull out from the trail, leaving a bit of a gap. Since I had left the car at Fielding Estates, I asked at Hidden Bench if the trail continued back through their vineyard toward Fielding. I was told that it does, but because they were picking that day, they didn’t want visitors walking around back there. So, they directed me across a different (un-marked) part of their property and, though I was frustrated, I went the way I was told to. I found it frustrating that none of the information about the trail indicates that they don’t want people on it at what seems like the best time of year – the autumn. Perhaps they’ll make that a bit clearer so that folks visiting can plan accordingly. 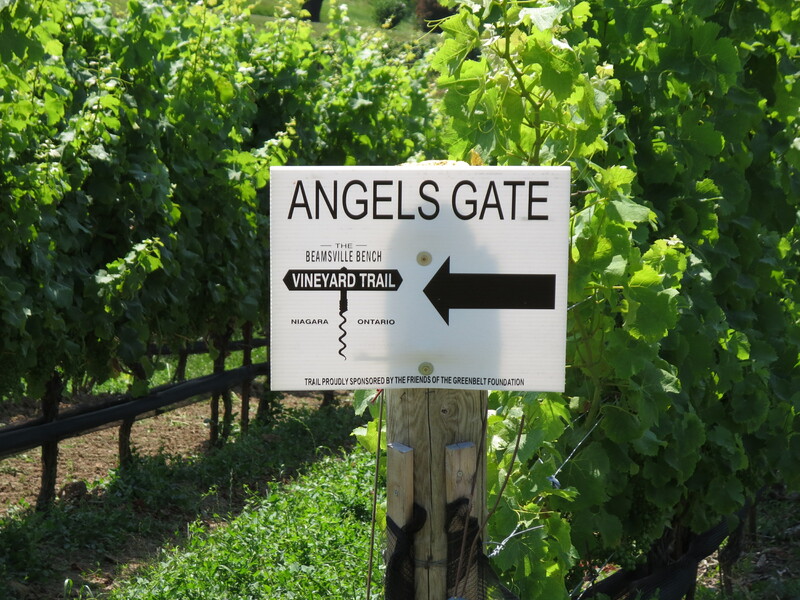 Yesterday — one of the hottest days of the summer — a friend and I set out to walk the new Beamsville Bench Vineyard Trail. 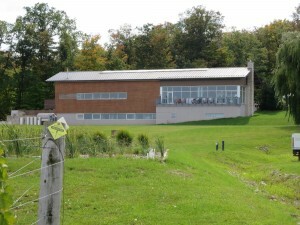 The trail, which was funded by the Friends of the Greenbelt Foundation and the Beamsville Bench Winery Association, opened June 1, 2013. The trail has two distinct segments that join six Beamsville wineries. 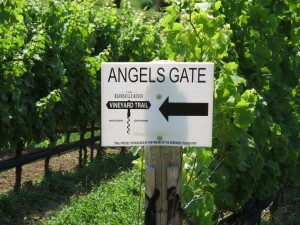 The “Lower Loop” is a very easy walk that joins Rosewood Estates Winery & Meadery, Angels Gate Winery, and Thirty Bench Wine Makers. 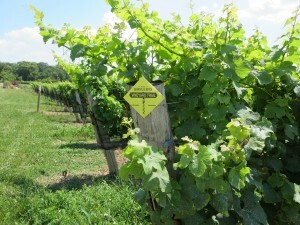 The trail is very well marked and this particular loop takes you directly through the rows of vines. It’s a terrific way of getting a close-up look at the trellising systems, the vines and, of course, the grapes. You can leave your car at any of the wineries and you can also pick up a trail map at all of them. We started at Rosewood and when we set out we looked at our watch to see how long it might take to hike the loop. Of course, as soon as we got to Thirty Bench we popped in — to cool off — and to try some of their newly released Riesling and Rose — and to shop a bit. After that, we headed back out to the trail and forgot to look at our watch. But, the Lower Loop is a pretty walk and really, the point of the trail isn’t so much about hiking, it’s about stopping in at the different wineries for tasting, buying, and enjoying! 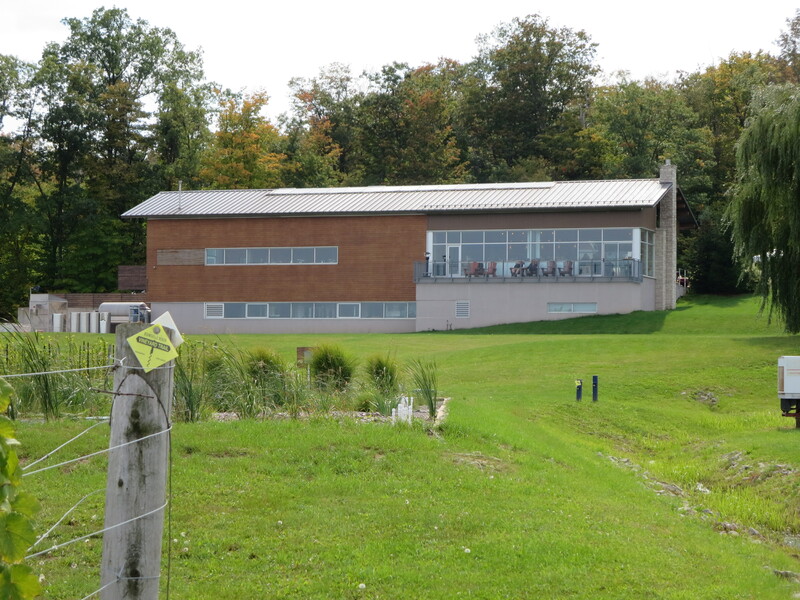 In addition to the two “loops” of the trail, there are also two side portions — the Angels’ Walk Side Trail and the Bruce Trail Side Trail, which we’ll no-doubt check out too.